Thailand, Vietnam, Bali and Malaysia feature prominently among the most popular currencies. "Savvy travellers know prices in Thailand, Bali and Vietnam are cheap when the value of sterling is uncertain"
Four Far East destinations have shown the biggest growth in Post Office Travel Money’s list of popular currencies this summer. Thailand, Vietnam, Bali and Malaysia fill four of the top 10 growth slots for June, July and August, reinforcing a wider trend this year. Research by the foreign exchange supplier revealed a 69% surge in demand for the Thai baht year-on-year this summer, while for the first eight months of 2017 demand was up 31%. Similarly, Post Office sales of the Vietnamese dong surged 29% for the June-August period and have risen 28% in 2017 to date, while the Indonesian rupiah made summer gains of 13%, which contributed to a 40% rise to date. Demand for the Malaysian ringgit rose 7% during the summer and 18% for January-August. Post Office Travel Money’s Andrew Brown said the trend would continue. “Looking forward to the autumn and winter, there is every reason to expect that UK tourists will head east for long-haul holidays if our summer currency sales are anything to go by,” he said. In Europe, Croatia has proved to be the big winner. 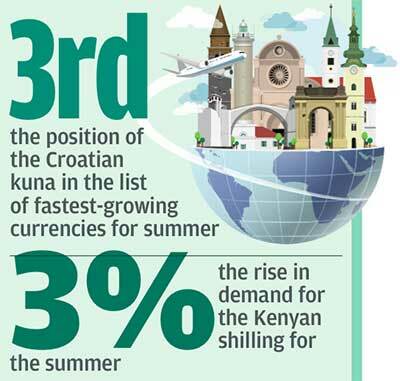 Post Office currency sales grew by a third to maintain the Croatian kuna’s third place in the summer list of fastest-growing currencies and in the overall table for 2017. Croatia has also reached its highest position of fourth in the Post Office’s bestselling currencies for June-August behind the euro, US dollar and Canadian dollar. In the past five years, sales of the kuna have doubled through the Post Office. One new entry to the league of the summer’s fastest growers was the Kenyan shilling. With a 3% rise in demand, the shilling has crept into the top 10, giving an indication that Kenya’s tourism industry is recovering following the terrorist attacks the country saw in recent years. Rise down under All these currencies were eclipsed by the 124% rise in summer demand for the New Zealand dollar, prompted, the Post Office believes, by The Lions’ summer rugby tour of the country. The Polish zloty is the only other European currency to feature in both the fastest-growing summer currencies and year-to-date top 10, with an 11% year-on-year sales rise for June-August and a 16% increase for 2017 as a whole. Warsaw recently rated second only to Prague for value in the Post Office’s annual Cost of Culture report, while Krakow was sixth cheapest in its City Costs Barometer of 36 European cities earlier in the year.